Strange meeting: Tracey Sinclair reviews Gary Kitching and Steve Byron’s two-hander about men left behind by social systems. Gary Kitching in Bacon Knees and Sausage Fingers at the Alphabetti, Newcastle. Design, James Pickering. Photo: Alphabetti Theatre. 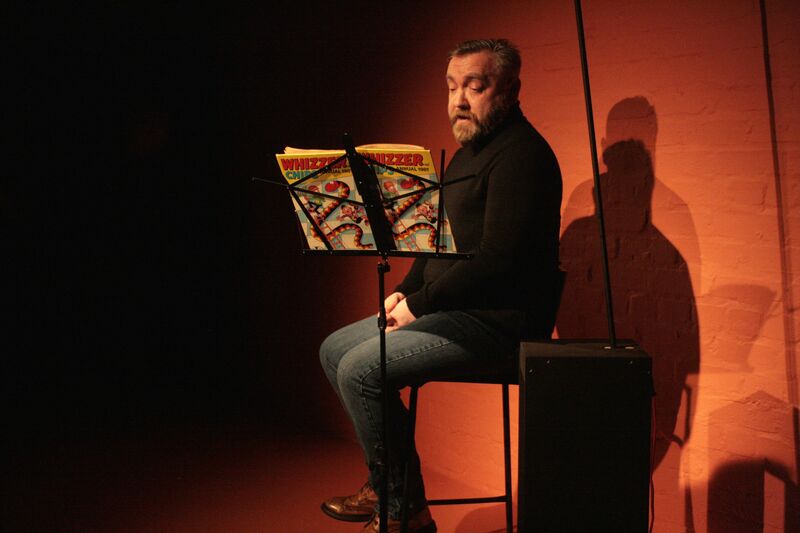 Bacon Knees and Sausage Fingers is a compact and compelling two-hander, tightly written and sympathetically performed by Gary Kitching and Steve Byron. A reworked version of their well-received 2016 show, it’s the story of two men, loners by personality or circumstance, who happen to meet on the High Level Bridge in Newcastle. One is dishevelled and dirty, with bacon tied to his knees, the other has a suitcase and a dog that he doesn’t seem overly fond of. What brought them here – and what might happen now that they have met? What starts as a production basked in the cosy glow of 70s nostalgia – fairground goldfish in plastic bags, sandshoes and Toffo sweets – darkens quickly, as each man recounts the path they have taken to this moment on the bridge. “Sausage Fingers” (Byron) was a boy marked out early by his disability and weight, but one whose natural tendency for isolation masks a bullying and petulant nature, a cruel and vengeful streak that becomes increasingly evident as his tale unfolds. In contrast, “Bacon Knees” (Kitching) is one of nature’s victims, desperately attempting to maintain a positive slant on a life that has unravelled. An unhappy childhood, a background of abuse and a spell in prison for a crime he isn’t equipped to understand (it’s strongly suggested he has some sort of learning disability) have led to him being here, alone and abandoned by an uncaring system. Both men excel in complex roles that are never allowed to slide into easy caricature. Director Ali Pritchard ensures the piece balances its strands of dark – often very funny – comedy and black, bleak tragedy, and keeps it from tipping too far into its own absurdism. Smartly supported by James Pickering’s design, where TV monitors offer ironic commentary on the dialogue, it teases with rose-tinted retrospection but understands full well the irony of Jim’ll Fix it being a Christmas Day TV highlight in ‘a decade when paedophiles hadn’t yet been invented’. As the men’s stories gradually unfurl, it becomes more and more obvious there never were any good old days. Their one fateful interaction is slowly built up, unpicked line by line, their conversation repeated, condensed, replayed as punctuation, each part of it is brought slowly into focus by their backstories. It’s a gimmick that starts to wear a little thin towards the end, but the piece has the sense to quit while it’s ahead, releasing all its pent up tension in a powerful and shocking denouement that nevertheless avoids any sense of pandering to a misery tourist’s taste for voyeuristic thrills. The show is something of an experiment for Alphabetti, a new writing focused theatre which tends to cater to one-off nights and much shorter runs. As part of its Arts Council funded writing and development programme, it is offering a chance for artists to stage ‘response pieces’ to the main show: a short set after the interval featuring work developed over a week or so, with the help of a mentor. This week’s piece was by poet / musician Diji Solanke (and friends), focusing on the damaged childhood at the heart of the play. Future responses are by two local companies: drag ensemble Bonnie & The Bonnettes and the charity theatre group The Twisting Ducks, which works with people who have learning disabilities or autism. Combined with the theatre’s Pay What You Feel philosophy, it’s a genuine effort at local engagement and, on this evidence, it’s an experiment that deserves every success. Bacon Knees and Sausage Fingers is on at the Alphabetti until 23rd February. More info here.